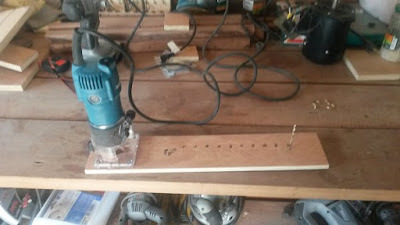 It's not often I have to cut circles, and when I do, they don't normally have to be that precise, but I am making a bench top disc sander, and the backing board need to be 99% circular. I have seen many options for Circle Cutting Jigs, from the very professional, to the quick and simple. I just want something that will do the job, so went for quick and simple. The other consideration, if you are going to make it with your router, is the size of your router. I have three, a big one, that for this job would be difficult to manage, a Dewalt medium sized router that is fixed in my router table wing on the table saw, and a Makita Trim router, which is very small, and will do the job on this occasion. So, all I needed was a piece of scrap 1/2" ply, longer than the diameter of the circle. You could just make one for the job in hand, but I decided I would make a re-usable jig, cutting up to 15", which would give me a 30" circle, however on this occasion I only want a 12" circle, so started mine at 6". I used a 5/32" bit to drill the holes for the centre pin, and marked that size on the jig, so I have no problem remembering when I come to use it. 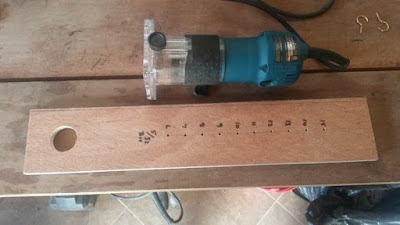 I then cut the hole for the router bit to pass through. The jig was then complete, but how to attach it. This is a problem with this particular trim router, because, it doesn't have a screw on plate, it has tiny bolts which screw into the plastic from below, I couldn't get identical threaded bolts, therefore, so as not to ruin the thread, I bought thinner screws, that I can screw in from above. Now I'm ready to start cutting circles, all I have to do is, place the router on the material in use, drill down through the appropriate hole, then insert the drill bit to use as a centre pin, and cut my circle with the router!